A small homestead in Central Maine. I had a very plesant surprise the other day: my apple jelly set up great! It was the first time I had ever tried making jelly and I’m proud of how it came out. It may be a little on the runnier side, but it’s jelly! 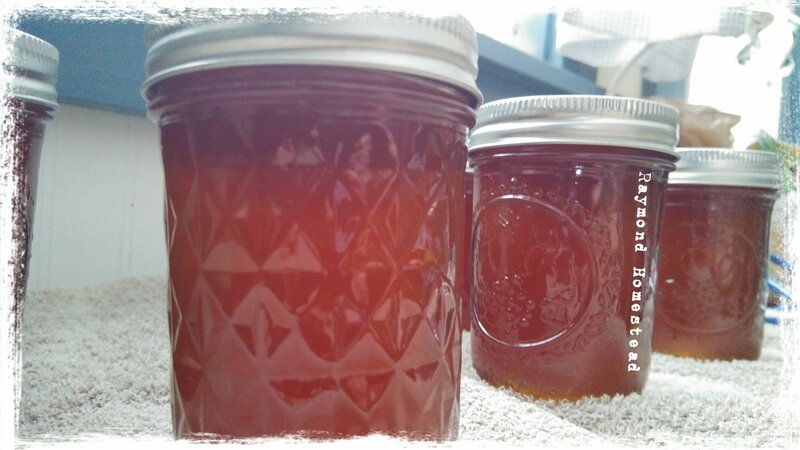 The apricot/apple jelly from the picture, my second batch, is another story. It didn’t even thicken into a syrup. After much angst and research, I went back to the store to pick up a second box of pectin to have a go at it. The plan was to rectify things by re-boiling the jelly, cooking it longer and testing it in a multitude of ways. Initially I started with nine jars worth of syrup. After cooking it longer, I ended up with seven and a smidge. Things looked to be testing well; even the rest batch in the looked to be jelling up. I went ahead and processed the seven jars in the water bath. I opened up the test jar this morning. Looks can most definitely be deceiving. While the apricot/apple acts like a jelly from the outside, its still a syrup on the spoon. Granted, it’s a super thick syrup, but it’s still a syrup. The plus side? It tastes just like the duck sauce from the local American-Chinese restaurant we order take-out from. So, while we don’t have apricot/apple jelly, we do have seven jars of duck sauce. This entry was posted in Cooking, DIY and tagged 2018, apple, apricot, canning, delicious mistakes, jelly, oops. Bookmark the permalink.